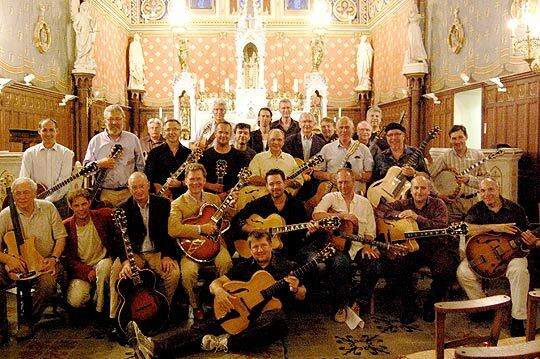 The 4th International Jazz Guitar Workshop in Aiguèze/South of France, held by Sonntag Guitars and Ulrich Hoffmeier is over. Once again. Each time when the course comes to its end everybody is full of sadness that the rooms need to be cleared and the guitars need to be put back into their cases. Just the prints of the wine glasses remain on the tables and faded music is floating through the rooms. A DVD with pictures, video and the recording of the concert on it remains as a reminder of a wonderful week. This hopefully helps increase the anticipation for the next workshop in 2009. The course was booked up for the first time since its introduction and a few interested participants needed to be put on a waiting list and in the end had to be left at home. The organizers Uli Hoffmeier and Stefan Sonntag highly regretted this on the one hand. 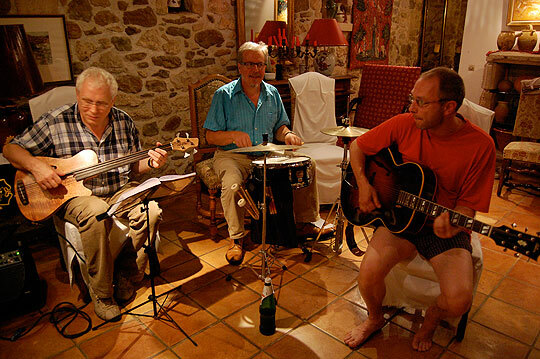 On the other hand the growing number of attendees confirmed the concept of combining guitar playing and holiday making in a beautiful setting and convenient atmosphere. The basic conditions were excellent and thanks to the earlier date in September the temperature was so ideal that the pool of the hotel was busily frequented. Actually there was no main theme for the workshop '08. But when booking Robin Nolan you know what it will be about. Robin brought along his teaching material about Django Reinhardt and Uli also prepared himself for teaching the music of Django. So in the end it turned out that the main theme of the course was Django Reinhardt. This style did not please every participant, we need to admit. Some of those were not very fond of this theme. But they could appreciate that many of the phrases and licks Django used are part of the mainstream jazz language as well. Everybody agreed that Django Reinhardt‘s melodies are unique and can be recognized immediately. However, the organizers take to heart the good suggestion of the participants that the theme will be officially named before the onset of the workshop in the future. No, Naabfeld is definitely not the name of an unknown guitarist or the name of a German town. These are the initials of the countries from where the participants came from: Norway, Austria, America, Belgium, France, England, Luxembourg, and Deutschland. In principal, our workshop has actually a hedonistic orientation. But one political remark you will allow me to make as the co-organizer: Can people of many nations understand each other through the common language of music? 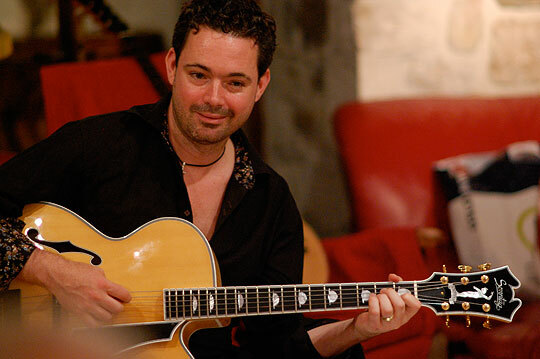 It pleases us that within the frame of this jazz guitar workshop people are motivated to connect, discussions are inspired, points of view explored, art is shared, as well as friendships, all happening at our jazz guitar course. You hardly could think of that 60 years ago …. When we began putting together these workshops in 2005, we wondered if an international course would work? Thank God, through the positive experience of having participants of various cultures and countries together in this workshop, we could now never imagine the course otherwise. Just as nice it is to notice, that the participant‘s delight in playing increases course for course. In the beginning guitarists were a little bit shy. But in '08 there were playing and sessions throughout the day. Most notably driven by Mr. 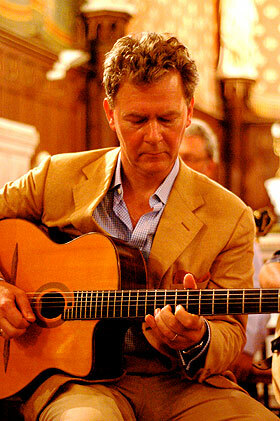 Rhythm himself, Jean-Pierre from Belgium, you could hear music in every corner of the venerable, old hotel Le Castelas. Where ever there was space for one person with a guitar, at least one guitarist was sitting and playing. And usually the sessions lasted until late into the night. A huge highlight of the workshop was the visit of Helmut Nieberle. 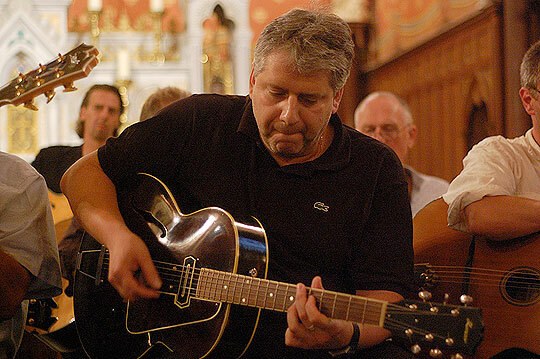 He is well known as the tutor of the Easter workshops of Sonntag Guitars in Augsburg. It happened that he spent some holidays not far from us and so he could make it to stop by. 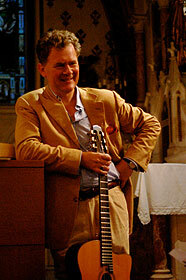 Helmut is a person who is sitting more comfortable with a guitar than without. 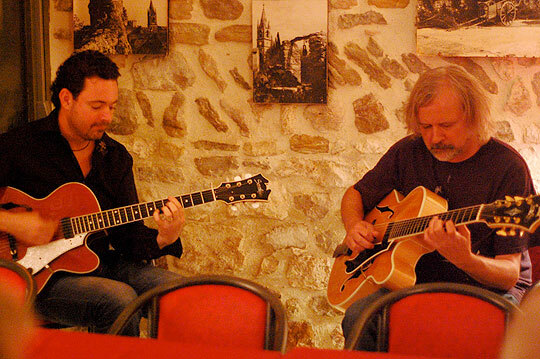 And so it was, after the dinner a spontaneous session started where the different styles of the both guitarists were clearly demonstrated. This year we could offer a premiere for the supporting program. Some of the participants like to spent the course with their partners, who then must do without their sweethearts while theese guys are attending the lessons. Usually the partners cared for themselves. Out of this grew the idea to offer a yoga course. 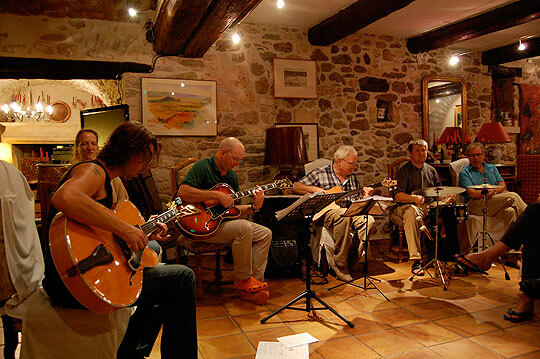 No sooner said than done, yoga and jazz, in Aiguéze! We were lucky to know the yoga teacher Anina von Molnar from Augsburg who we could book for this course. All of the girls who joined her yoga course were highly excited about Anina‘s intense teaching! And even the males were taken by enthusiasm as Anina also offered massages for both the yoga participants and the guitarists. Even Marlèn, the generous host of the accomodation ‘la mazet’ (which ended up being not only a great holiday accomodation, but a perfect massage venue as well) could take advantage of the offer and recieved a massage also (thank you Marlèn for all the clean towels stacked ready to use!). A public concert was the crowning conclusion of the workshop week. 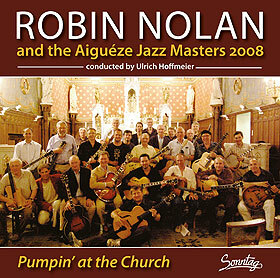 This concert was held again at the church of the village with all participants involved plus the tutors Robin Nolan and Uli Hoffmeier. The mayor of Aguèze was very cooperative again. It is an awesome site seeing 25 guitarists lined up in front of the altar. The acoustic effect sounds like a Dolby- surround- system! 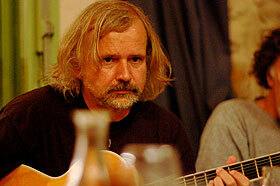 Uli put together a very diversified programm: Some tunes written by Django Reinhardt, matching the course theme. Other tunes were dedicated to the nations of the participants: Some German songs of the Django era („Wenn der weiße Flieder wieder blüht“), the hosting country France was honoured with a Sascha Distel tune („Ma premiere guitar“) and the Norwegians, who had the longest trip of all, played a jazzy arrangement of a Norwegian folk song („Danse Norvégienne“). The church was completely packed. Hèrvè Ventajol, the boss of our hotel, did a very good job in advertising and created a worthy scenery for the Aiguéze Jazz Masters. Now, what is left to say? Uli and I are hoping that the guys will stay in the groove. And hopefully we can spent a swinging week in the South of France again next year. It is still to be decided where we will hold next year's event. 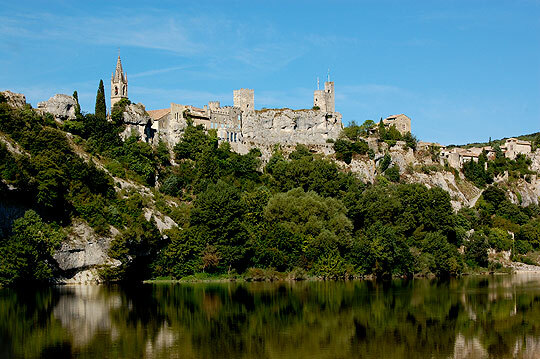 We discovered a very nice hotel one hour south of Avignon which might be suitable for the course even better than Le Castelas. 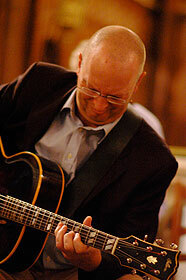 It will be sure that the announcement for the 5th International Jazz Guitar Course 2009 will be online on www.sonntag-guitars.com at the end of 2008.